- Max. Working Pressure 700bar. - Tendon length for gripping is more. - Long strokes for stressing long tendons in one pull. 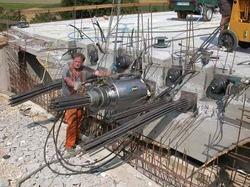 - Pre-stressing and post tensioning of tendons in concrete structure. - Smaller diameter is advantageous for locating in cavities. We manufacture strand jacks from 15 tonnes to 1700 tonnes capacity, along with power packs and computer control system. Single strand jacks up to 25 ton capacity using 18mm diameter H.T. strands are manufactured by Bygging. These jacks find use in lifting of steel flues for chimneys, and to lift horizontal tanks, vessels and de-aerators. Multistrand jacks upto 180 ton lifting capacity are used for boiler drum lifts. High Torque Systems Pvt. Ltd.